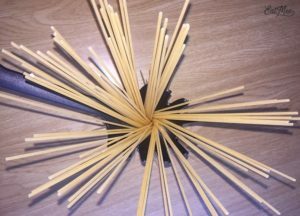 Have you ever tried preparing spaghetti for yourself & ended up making too much or too less? How about preparing it for multiple people? 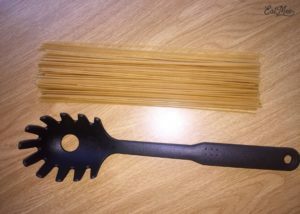 We all have those measurements wrong so hopefully this spaghetti portion serving tip will help you. 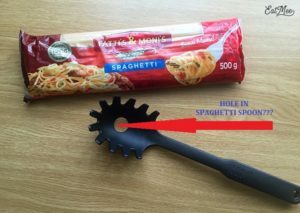 Have you ever wondered what the hole in the spaghetti spoon (maybe more precisely depicted as a spork) is? Well if you didn’t, it’s actually there to help you measure a single portion of spaghetti. Amazing right? The opening can be utilized to allot around one serving of spaghetti. However many dry noodles fit into that opening is considered a single serving. So rather than just tossing a pack of spaghetti noodles into a bubbling pot of water & trusting it’s sufficient (or not all that much) you can now make sure you’re cooking the appropriate sum all on account of this helpful hole. 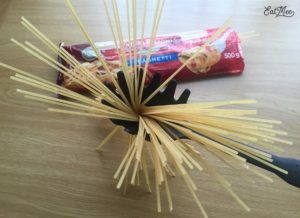 Unfortunately, this technique doesn’t work for pasta noodles other than spaghetti. Being a spaghetti lover, I myself was impressed by this tip. Hopefully this Spaghetti Portion Serving Tip will help you out as well. Now that you’re amazed by this tip, go get this utensil if you don’t already have one & use it as it was designed to be used.